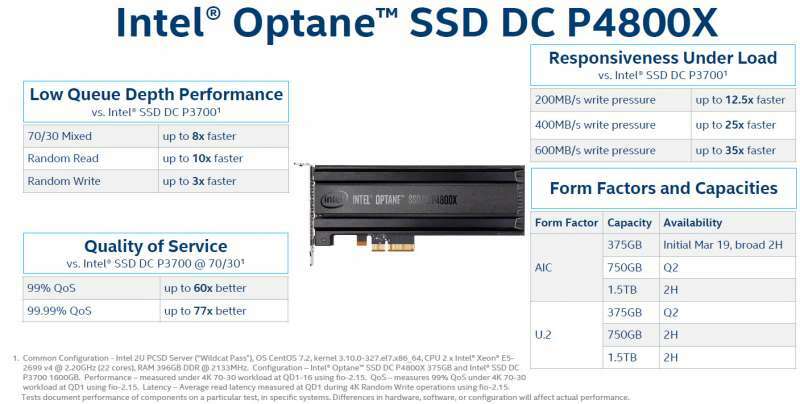 Several months ago, a leaked spec sheet detailed an upcoming Intel 3D XPoint SSD, the Optane SSD DC P4800X, which was officially launched today finally proving that despite numerous delays, 3D XPoint isn’t the vaporware many of us expected it to be. 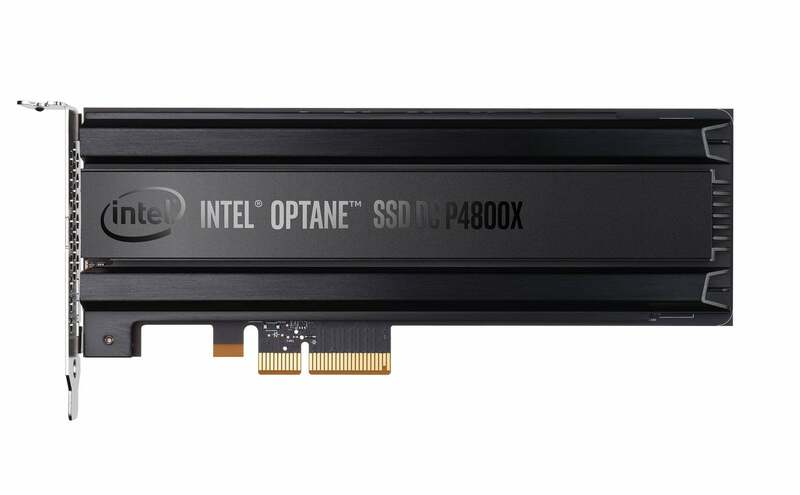 Initially launching in a 375GB Add-in-Card (AIC), the Intel Optane SSD DC P4800X is designed for high write enterprise workloads. As such, performance is heavily oriented towards random read/write workloads and quality of service. In the above specs, we can see that Intel doesn’t even bother listing the sequential performance numbers. As a drive designed to be used for high write applications, the Intel SSD DC P4800X features an endurance of 12.3PBW, or around 30 DWPD based on a 5 year warranty. As expected, all drive internals from the 3D XPoint to the onboard controller to the firmware are all developed in-house by Intel. As a DC drive, performance is strictly tuned for response times, random read/write and QoS (Quality of Service). Compared to Intel’s NAND based Intel SSD DC P3700, the new SSD DC P4800X is significantly faster with as much as 40x lower average latency and 100x improvement in QoS. It can also reach significantly higher random read/write performance at lower queue depths. Intel claims the SSD DC P4800X is able to reach over 500,000 IOPS at QD12 whereas the Intel DC P3700 can’t even reach 100,000 IOPS at the same queue depth. While this isn’t the 1000x faster number Intel and Micron originally claimed when they announced 3D XPoint several years ago, it’s not bad either. While the Intel Optane SSD DC P4800X is NVMe complaint Intel is also releasing a driver which will allow the drive to work to its full potential. The driver emulates a single volatile memory pool which allows the Optane SSD DC P4800X to be used as system RAM. Intel will launch a AIC with a 375GB capacity starting today followed by the 750GB AIC and 375GB U.2 form factor drive in 2Q2017. Intel will then release the 1.5TB AIC along with the 750GB and 1.5TB U.2 form factor drives in the 2H2017. Pricing on the Intel Optane SSD DC P4800X 375GB is expected to be $1,520 making the drive a staggering $4.05/GB. However, there is still significant value proposition here as Intel Optane is still quite a bit cheaper than the DRAM it’s designed to replace, which easily averages around $10/GB. More information about the Intel Optane SSD DC P4800X is available at the Intel website here.